Tuesday night, June 12th, I went out to Brandon to attend the first of several open houses HART is hosting before a public hearing and an official decision from the board on the November service and fare changes. As it was my first time attending an official HART meeting, I was a little apprehensive, but nonetheless excited and intrigued. Since I reside in downtown Tampa, just getting to the meeting itself was half the journey. Below is a bit about the different routes I used to get to/from the meeting, and everything that happened at the meeting itself. To get out to Brandon, I had several options. 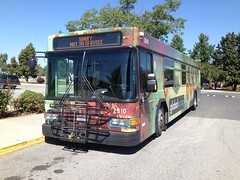 One was to board Route 8, running between Marion Transit Center (the downtown hub) and Westfield Mall in Brandon. However, I elected not to ride the 8 as I didn’t feel like spending 76 minutes on that bus. Another option I had been to board Route 27LX, which is a peak-only commuter route running between Marion Transit Center and various neighborhoods in the suburbs east of Tampa, including Brandon. I elected not to use this route not for the amount of time spent onboard, but for the lack of an easy transfer between the 27LX and all the routes that directly serve Westfield Mall (which functions as the transit center for Brandon). The last option I had was to board Route 46, which is what I elected to do. Route 46, while operating as a local route, is a bit unusual in the fact that it only operates during peak hours. 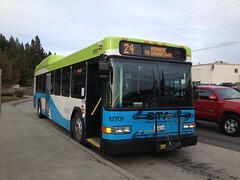 It is also the only route (local or commuter) that serves downtown directly without making a stop at Marion Transit Center (which is on the north end of downtown). When I first got on the 46 at the Jackson/Marion stop, the bus was already running 4 minutes late. I wasn’t too concerned at first, since it’s a low ridership route and travels along some high-speed roads. Theoretically, that’d mean making up time would be a piece of cake. Alas, that wasn’t the case. Though the driver was trying as much as she could to make up lost time (while still staying in control and keeping the bus safe), we ended up arriving at Westfield Mall at 5:03PM, 6 minutes late according to the schedule. This wouldn’t have been too big of a deal, but the issue I had been that the bus I needed to connect to, Route 37, was due to leave at 5:00PM. Not sure what exactly to do, I sat down at the bus shelter and eventually was prepared to wait until the 6:00 Rt. 37, as the 5:30 departure was running on the short trip via Providence Road and wouldn’t have gotten me to the meeting. However, I found out that luck was on my side when I saw the Brandon Flex pulling into the mall about 10 minutes late. (Flex is a route-deviated service operated in various areas throughout the county by HART where fixed-route service is neither cost-effective nor demanded.) While HART recommends that riders have a reservation to guarantee a ride, there is the option of walk-up service as well (only if seats are available). As there was only one passenger in the cutaway van, I had no trouble getting walk-up service. I told the driver I was heading to the Brandon Regional Service Center, and just like that we left Westfield Mall and were on our way. About 5 minutes later, I was dropped off at the front door, and then I went inside for the open house. Eliminate Route 28X (Plant City-Downtown). Among the 12 different express routes, the 28X has the 3rd-worst ridership (based on average passenger counts per-day). Consolidate Route 61LX (Northwest TC-Downtown) and Route 50X (Citrus Park/Carrollwood-Downtown). These two routes have the worst and 2nd-worst ridership among the express routes, but both serve a large area. In lieu of cutting/reducing service on both routes, a consolidation makes the most sense. The new (and still unnumbered) route will run from Carrollwood Baptist Church P&R, then serve Citrus Park P&R. After that stop, it will run south on Sheldon Rd (with some new LX stops presumably), and then run along the entirety of the current 61LX from Northwest TC to the Westshore area and downtown. Change holiday service levels for Memorial Day, July 4th, and Labor Day from Saturday levels to Sunday levels. Eliminate express service on Presidents Day and Columbus Day, but still maintain regular local service on those days. Revise Route 37 to have all trips follow the current “short” trip (via Providence Road), eliminating service to Oakfield Dr, Brandon Blvd, and Brandon Hospital. Revise Brandon Flex to have a dedicated loop route and add parts of the area being cut off from the Route 37 revision. Reinvest cost savings to Route 30 and Route 34. Both these routes have been running notoriously behind schedule, making 30-min headways impossible to maintain. With the service hours being saved from the above cuts, service hours will be distributed out to these routes to guarantee 30-min headways. Also on the table are changes to bus fares. HART has not had an increase in their fares since 2008. They last reviewed them in 2010, but the board didn’t feel the need to change them at that time, particularly since HART was trying to pass a tax-referendum at the time. I’ll list some examples below, but if you’re curious, here is the full list of fare changes. One-Way Local Fare – Increase from $1.75 to $2. All-Day Local Fare – Increase from $3.75 to $4. 31-Day Local Pass – Increase from $60 to $65. 10-Ride HARTPlus (Paratransit) Pass – Increase from $35 to $40. As I mentioned earlier, there were about 7 people that came to the open house, which was running from 5:30-7:00PM. One person came with questions about the consolidated 50X/61LX, another was upset over the prospect of losing the 28X. A couple more came with many questions, which from the impression I got by watching the conversations were answered to their satisfaction. Representing HART at the open house was Steve Feigenbaum from the planning department, Kevin (I believe that was his name, my apologies if I’m recalling it incorrectly), and Marcia Mejia, HART’s public information representative (often seen in HART’s YouTube videos.) As we talked about various stuff at HART, I mentioned something about Ben Franklin Transit. As it turns out, Steve, in his previous work experience, had actually done independent work with BFT back in the mid-90’s. Needless to say, I thought that was pretty cool. Once the meeting was over, I had to myself a ride back to downtown, since Brandon is about 12 miles east and nowhere near the place I reside at. Luckily, HART seems smart enough to place their open houses at locations that people can get to via bus, and then still be able to leave with the bus route(s) still being in service (something that never happens at BFT board meetings, which always has annoyed me). In this case, I had to just walk outside and walk a short distance to Oakfield Drive where there was a bus stop for Route 37. (Ironically, this won’t be an option after November if the proposed changes to Route 37 and Brandon Flex go into effect.) As far as I can tell, the bus arrived to the stop right on time. However, I would have found it acceptable if the bus had been running far behind schedule. On the driver’s previous run on the 8 (the routes interline on weekdays, switching at Westfield Mall), a passenger had been trying to sell a taser at the bus stop, and then showed it to the bus driver while boarding. In the immortal words of Red Forman, “Dumbass!” Since it was the driver’s last run of the night, I think he was just ready for the day to be done, and he held the route on time for the rest of the way. It also didn’t hurt that the passenger load was pretty light for the run, which isn’t too surprising given the time of the day and the suburban nature of the area the route runs in. The bus was due in to NetP@rk TC at 8:00, but I disembarked just before the EOL at the corner of Martin Luther King Jr Blvd and 50th. That way I would be able to connect to Route 6, due to leave towards downtown at 7:58. 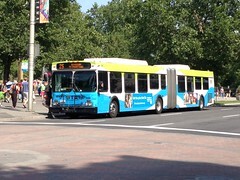 Route 6, as most regular riders know, is one of HART’s busiest routes. During peak-hours, the bus runs on 15/20 minute headways (emphasis is put on peak-direction for run placement), while during off-peak it runs every 30 minutes. Planning officials have added this route to the list of routes in need of additional service hours, as many runs are becoming standing-room only. However, at 8:00PM at night, the bus wasn’t too full that I couldn’t find a seat, but there were still plenty of riders on board. Route 6 is also the only route that runs by HART’s operations base, so it’s not uncommon to find driver’s on the bus either leaving/coming in for the day or heading out for their shift/coming in from their shift. Having rarely ever seen drivers at BFT do this sort of thing (via Route 110), I always enjoy bus drivers actually using public transit. It also doesn’t hurt that bus drivers always ride for free by simply showing their ID badge. Something I didn’t mention earlier was that also in attendance at the meeting was a reporter from the Tampa Bay Times, Kevin Brady. Today, Thursday June 14th, his story on the open house made it into the paper. It’s a good summary of the open house, covering much the same of what I just wrote about. I also wanted to point it out because I got quoted in it. Most of my regular readers know this already, but to those both new and old at TransitZac, I always encourage you to share your thoughts via a comment below or by tweeting me at @ziggzagzac. First of all, welcome to Tampa Bay. I hope you will be able to enjoy all that we have to offer. Second, thank you for following my blog. I’ve had my blog for a few years now actually, but recently moved to WordPress. I’ve actually used the HART system for about three years before being able to get my own vehicle. And even now, I still use the system from time to time. I reside in South Tampa and have used Routes 4, 19, 30, and 36, as well as Routes 5, 6, 12, and 18 towards the University of South Florida. I’ve also been to an open house that was in regards to HART’s upcoming bus rapid transit system, called MetroRapid. Please feel free to follow me on my twitter feed as well @TampaBayTransit. I will also be re-activating my Facebook page in August, so stay tuned for that as well.